It's yours for a cool $825, assuming you can pick it up from the UK. Update: The Warthog has found a home! Back in 2009, a group of dedicated fans banded together to make Operation Chastity, a live-action Halo fan film. To that end, writer/director/producer Peter Cooper constructed a full-sized M12 Force Application Vehicle, better known as the Warthog. The movie was eventually put on indefinite hold, and now years later, Cooper can't afford to keep it around. While he's been trying to off load the troop transport for over a year now, the time has come; the Warthog has to go by January 1st or it's off to the junk yard. 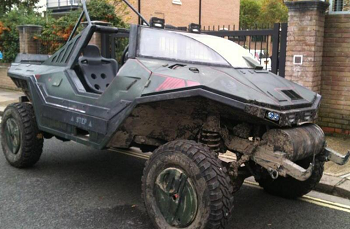 "Last call for Halo fans who want a Warthog," Cooper tweeted. "If I don't have a confirmed sale tomorrow, she goes to scrap." Cooper's currently asking Â£500 ($824.40), but you have to be able to collect the vehicle from Hertfordshire, England. It's obvious that Cooper's pretty desperate to get rid of the thing, so it should be interesting to see if someone snaps it up in time. The non-road legal Warthog uses a 1983 Land Rover Defender 110 as a frame, the entire conversion process of which is documented here. The design was based on a toy model. When it was scaled up, there was only a 40mm difference between the two. It may not be quite as detailed as the one WETA Workshop made, but it's still an impressive piece of work.